Soft cover, 91 pages, 95 colour photographs / sequences, 7 b/w photographs, 17 illustrations, 1 strip cartoon, 15 advertisements. Originally conceived as a design retrospective surfing film (Tom Parrish 1995, Terry Fitzgerald 1996, Wooden boards 1997) this companion book features several significant articles, one on Terry Fiztgerald designs and interviews with Wayne Lynch and Albert Falzon. The illustrations by Mark Sutherland are strangely unappealing and the inclusion of surf poetry is, as usual, unfortunate. 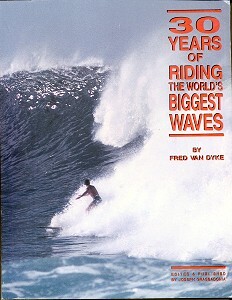 A pervasive "soul surfing" theme, for example Mark Sutherland’s essay on the commercial and technological invasion of surfing (page 8) is somewhat compromised by the collective's advertisements to buy Litmus: the book, the video, the compact disc, the tee shirt, the sweater (pages 1, 2 and 82). First released in 1996 at $15 it was remarketed in November 1998 with a sticker covering the original price – “The Ultimate Surfing Experience : Only $5”. Answer : “Give up, ha!” (page 44). 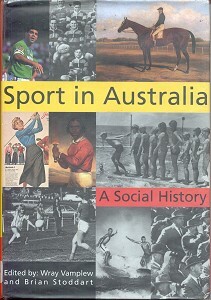 Sport in Australia - A Social History. The Pitt Building, Trumpington Street, Cambridge CB2 1RP, UK, 1994. Hard cover, 346 pages, black and white photographs, Notes, Index. The article of interest is Chapter 13 Swimming, Surfing and Life Saving by Douglas Booth, pages 231 to 254. While dealing with a number of diverse issues, the principle focus is "the history of disiplined permissiveness and the transformation of repressive body regimes", page 232. First edition, 1974, Second edition 1993, second printing 1993. Hard cover, 440 pages, black and white diagrams and photographs, References, Index. 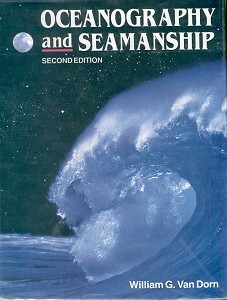 Extremely detailed work on oceanography with a focus, as indicated by the title, on sail and powerboat marineers. Surfriders will find most relevant material in Part IV: Principles of Wave Motion and Part V: Ocean Waves. "Expenenced surters become expert judges of relative breaker height, but "professional" modesty shades their absolute estimates by about a factor of two. By simple scaling, the comber shown in plate 21 (possibly Reno Abellira, Sunset Beach by Dr. Don James) is cresting over 32 feet high, but the "surfer's estimate" here would probably run from 15 to 18 feet, depending on his or her audience, respectively. More precise estimates are easily made by anyone from shore, by planting a pole in the sand, and marking the point on it that coincides with your line of sight across breaker crest to horizon. The elevation of this point above mean sea level can then be determined between groups of waves, when the sea is temporarily calm. Add 25 percent for trough depression to obtain the crest height. I have done this many times in the presence of witnesses-but surfers are hard to convince." - page 224. Compare and contrast this with the Willard Bascom's method. See Appendix: How to measure waves. This book was suggested as a significant reference by Nick Carroll, May 2008. Ocean Sports international Publishing Group Inc.
Volume 44 Number 3. 2000. Soft cover, 38 pages, colour photographs, black and white photographs, Acknowledgements. Essentially ten personal interviews - answers to nine set questions - with contributor and interviewee profiles. Contributors include Bill Flores, Venura's first local surfer, and Karl Pope of Morey-Pope Surfboards. The questions serve as a informative format for further surf researchers. 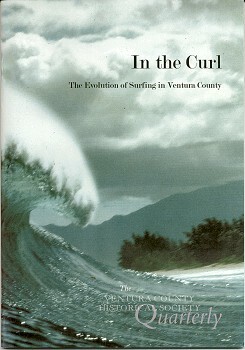 Accompanied by an excellent article, The Arrival of Surfing in Southern California by Arthur C. Verge. The dramatic cover is a flipped image of Pipeline, Ohau, 1975 by Leroy Grannis.